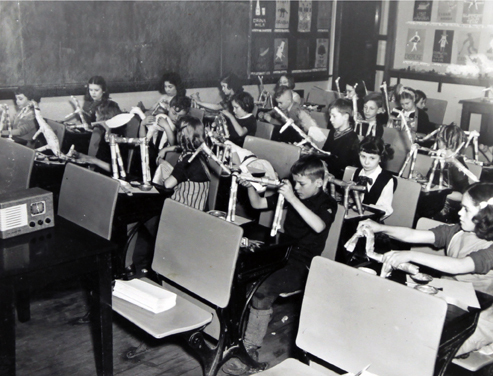 Above: Technology in the classroom: Connaught students follow radio broadcast instructions for making paper animals, February, 1950. Photo by James J. Walter. 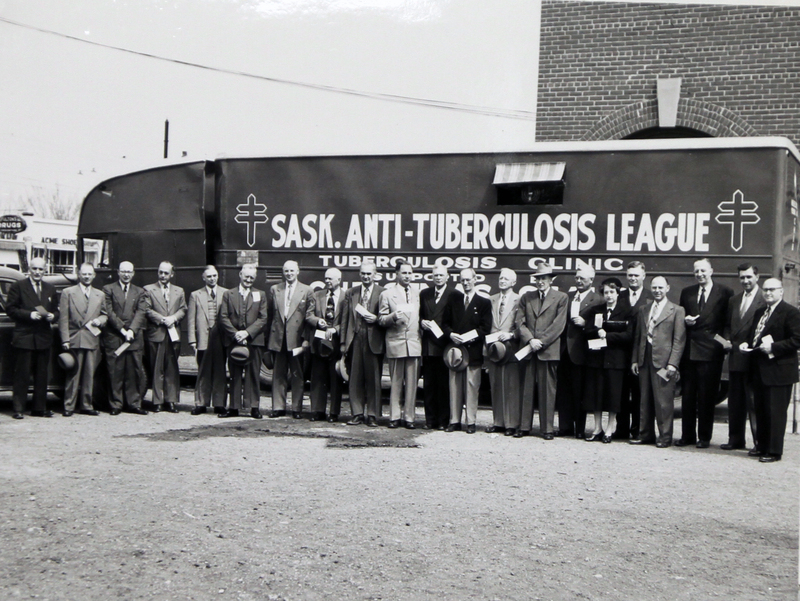 Saskatchewan Archives Board. The building may look much the same, but life at Connaught has changed a great deal over the years. Here’s are some examples of what school life was like during the 1940s and ‘50s, from the memories of four former students. Until its round gymnasium was added in 1958, Connaught’s students gathered, performed, and exercised in the wide and high-ceilinged hallways. 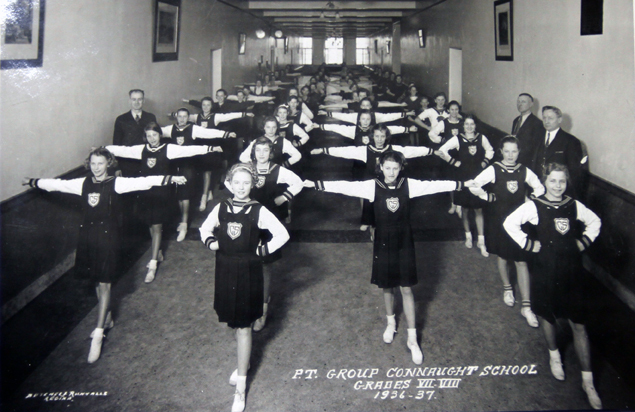 Though physical education was not as big part of elementary education as it is now, an instructor would sometimes visit the school, gather students in the hall, and lead them through basic exercises like toe-touches and push-ups. Any event that required space to hold a large group – like graduations and Christmas concerts — also took place in the corridors, with chairs arranged in front of a temporary stage. But packing so many people into a space with no air conditioning had some risks, recalls Merv Brandt. Perhaps not surprising for a school named after English royalty, Connaught long harboured a strong pro-British sentiment. Three decades before it helped pioneer Regina’s French immersion program, Connaught was instead teaching its students ‘The Maple Leaf Forever,’ a nationalistic song that celebrated the French defeat on the Plains of Abraham. Instead of a junior side and senior side, the school playground was segregated into a girls’ side and a boys’ side. The boys’ side, south of the school, was much larger than the girls’ side on the north – but that didn’t mean the boys got all the luck, recalls Ken Zaren. 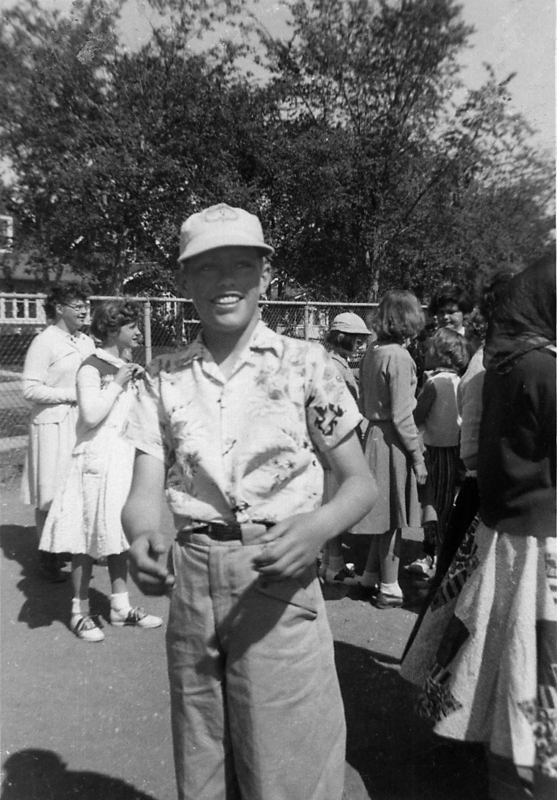 Student Don Leman on the playground, around 1957. Don says it was possibly during a sports day. The different sexes used used separate entrances, as well. The entrance now bearing a Wise Owl sign was once marked ‘Girls.’ The boys had their own labelled entrance that is now covered by the breezeway leading to the gym. The separate entrances “sort of seem was strange when you think about it, because (we) all wound up in the same classrooms anyway,” notes George Beckett. The businesses around Connaught school during the 40s and 50s offered plenty of temptation for students with a bit of spare change – but as far as as teachers and the principal were concerned, they were forbidden ground. Directly across 13th Avenue were several attractive stops: a drugstore, a grocery store, and the White Castle confectionery. All were officially off-limits during school hours, says George Beckett. 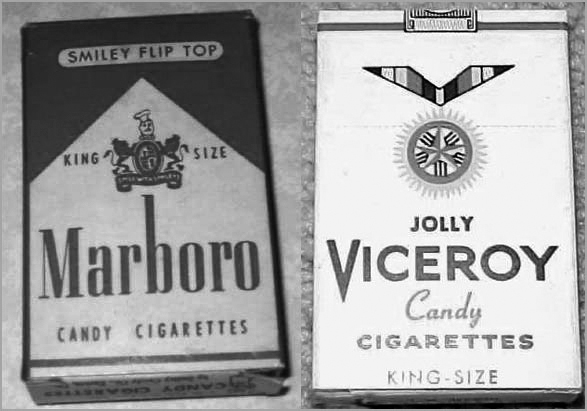 Candy cigarettes were a popular confectionary item – and so were the real things! “Of course, although it was out of bounds to go there, kids were quickly running across to buy things during recess,” he adds. “There were lots of dares in those days,” and a common one was to defy the authorities by crossing the street for some forbidden shopping. But the White Castle was at least fair game for students after class let out – unlike its nearby competitor, the Dew Drop Inn. The Inn was the sort of place that a student could hang out and smoke a cigarette uninterrupted, recalls Ken Zaren. It was also the sort of place the principal considered a bad influence. “In those days, behind the door of the classroom hung a long leather strap. And of course if you did something that you weren’t supposed to, you had to go out to the hallway and hold your hands out while the teacher whacked them with the strap,” says Merv Brandt, who suffered the punishment more than a few times himself. Life at Connaught was a great deal more regimented, disciplined, and strictly organized in those days. “The atmosphere was, I don’t want to call it militaristic, but in some respects it was. Discipline was at the top of the list,” says George Beckett. The way students entered the building when the bell rang certainly reflected that: they would line up outside the building until told to enter, and then march single-file through the halls, keeping to the darker-patterned sections of floor along the walls. “We’d have to stay in those lines,” explains Ken Zaren. “We’d walk along there ’til we got to our classroom, and if it was our class we’d go in; if it wasn’t, we’d keep going. And each teacher would stand at his or her door” to watch their students enter. Things didn’t necessarily turn any more lighthearted once in the classroom; the relationship between students and staff was a distant and formal one. Zaren, who attended Connaught several years after Beckett, remembers it a little differently. He had a warmer and more casual relationship with his teachers, but still feared a school authority. “The principal was God,” he says – a frightening figure who could, and would, fiercely berate students for something as minor as leaning with one foot on the wall while waiting to go inside. Connaught’s male students – manual training was for boys only – at least got to stay in their own school for the class. Connaught had no room or equipment to teach home economics, the equivalent course for girls. So female students made weekly trips to a school that did have the facilities, trading places with male students that needed to borrow Connaught’s shop. Those weekly forays into cooking or woodworking were about as unconventional as classes got during the 40s and 50s. There were no languages other than English studied, physical education wasn’t part of the curriculum, and career education was half a century away. Extracurricular activities and field trips were very limited, too, adds Beckett. Though school leagues were largely nonexistent, and physical education not yet part of the curriculum, sports and games were still a key fixture of student life. During the warmer months, there were two main sports: baseball, which the students knew how to play properly, and soccer, which they barely understood. Even more confusing, there were often several games going on at once on the same field, adds Bill Shank. Simpler and better understood than soccer was an old schoolyard game, called ‘pom-pom-pull-way.’ The rules were simple enough: one students started as the ‘catcher,’ and everyone else had to run past him when he gave the word; anyone he tagged joined him in catching the others. Pom-pom-pullaway was a game for all seasons, but in winter baseball and soccer gave way to hockey as the sport of choice. Most boys signed up at school to play city league hockey at the rink on the corner of Victoria and McTavish, and spent their recesses playing a version of the game as well. George Beckett also recalls taking part in a somewhat makeshift effort to teach him and his fellow students curling. 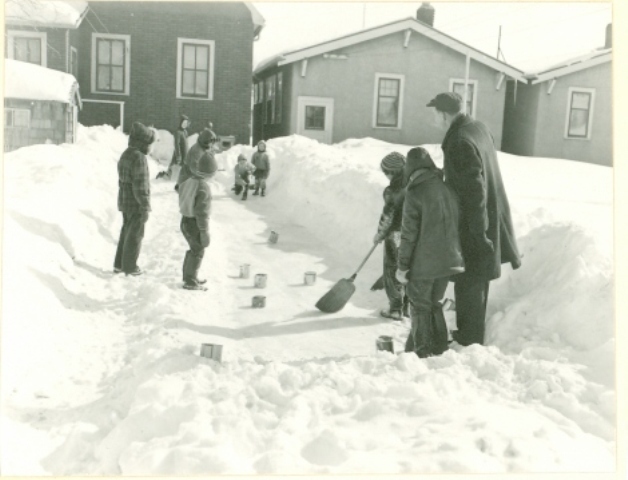 A section of the schoolyard was flooded to make a curling rink; it was played on using ‘rocks’ that were actually large, empty jam tins filled with ice and fitted with a handle. Hockey and jam-tin curling could only take place outside, though, and bitingly cold Saskatchewan winters meant Connaught students spent more than a few recesses confined to the school basement. During those indoor recesses, marbles was the game of choice. Playing marbles “was a big deal at the time,” says Ken Zaren, and students played for keeps. Many would bring upright boards with several holes drilled through, and if a challenger could shoot a marble through one of the holes, they won a marble from board’s owner; if not, their poorly-shot marble was forfeit. 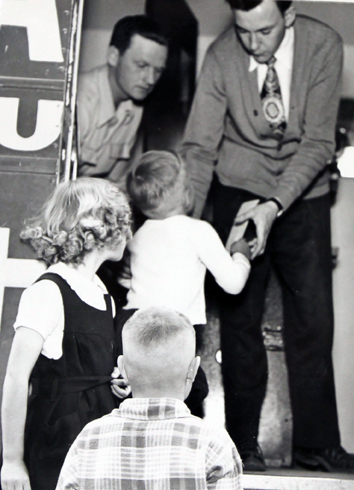 A 1952 TB Bus visit to Connaught School. Vic Bull Photos. Saskatchewan Archives Board R-A 11,308.